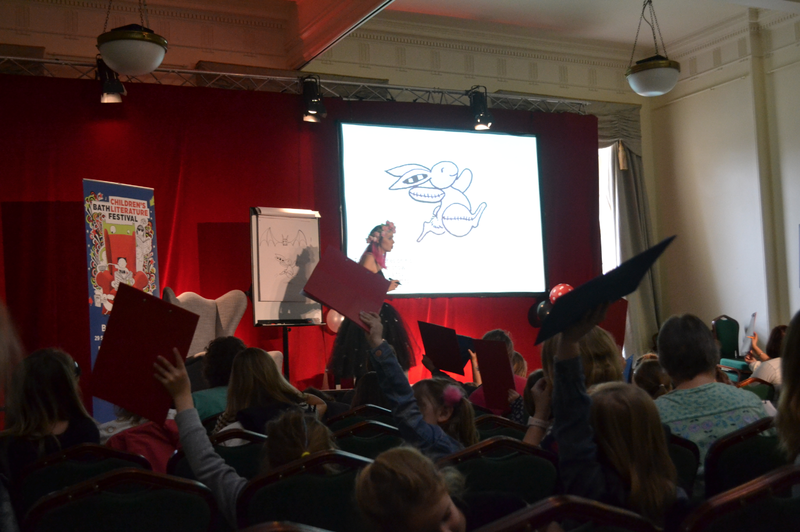 Last Sunday was the first stop on my Isadora Moon autumn ‘tour’ – Bath Children’s Literature Festival. I felt a bit nervous when I saw the stage. This was my first time in a room big enough to need a microphone. Once I was up there though, I was just focused on the event and it seemed to go well. There were even quite a few children dressed up as fairies and vampires, and one as Pink Rabbit! This was actually my third trip to Bath in a year. Henry and I came to the Children’s Literature Festival last year so I could watch some other author’s events. This was on the advice of my publisher, as I hadn’t done any of my own at the point. I was seven months pregnant at that time and I remember thinking how odd I must have looked: a lone pregnant adult sitting in an event for children with a notebook. by the end of the event, I was so hot I thought I might faint, and had to dash out! While I was in the event, Henry had been for a wander round the town. He said it looked nice, so we decided to come back for a mini-break in the spring. Bath is surrounded by beautiful countryside, so we rented a little cottage for three days in March. That was my second trip to Bath. Of course my third trip to Bath was to actually perform at the Bath Children’s Literature Festival. This being a proper two-week-long festival, I knew I had to step up my game with my costume. It had to be a combination of pink and black, to represent Isadora’s fairy and vampire sides. It also had to be sparkly. And since Isadora loves doing ballet in her black tutu, a black ballet ensemble seemed like a perfect fit. I set to work tracking down a long tutu and black leotard. They arrived just a week before the event. When I wasn’t making my 3D illustration of Isadora Moon’s kitchen, I was putting together my costume. I couldn’t find the exact sort of glittery stars I wanted online, so I had to make them. Using some glittery fabric I cut out stars of all different sizes, then I glued them onto the tutu. I used a similar technique for the necklace. Actually, almost my whole outfit is home-made, as I also put together the flower crown with plastic flowers from Poundland! We drove up to Bath the night before and stayed in the Travelodge. We set off after dinner and arrived quite late – about 9.30pm. At that time, I’m sure we looked pretty strange with a baby in a pram and several bags of luggage weaving our way through crowds of drunk people on a night out in the city centre. It turned out our Travelodge was right next door to a club, although the noise, surprisingly, wasn’t too bad. As I was coming back up from the sound check, we passed Kaye Umansky heading down for her event. It took me a second to realise who she was, as we passed so quickly in the busy corridor, but I would love to have been able to speak with her. She is the author of the Pongwiffy books, which are some of my favourites from when I was young. Before the event I was thinking, ’45 minutes! How will I keep the children engaged for 45 minutes?’ Once I was up there though, the time flew by – for me at least! I demonstrated how to draw some Isadora Moon characters, asked the children what their best school trip would be, and did a ‘What magical creature are you quiz?’ A lot of the children established they would be hybrids, like Isadora Moon, so we had a mer-vampire, a ghost-fairy and even a ghost-dragon-vampire! One child suggested a trip to Marshmallow Land would be the best – perhaps there would be a marshmallow bouncy castle! The children also asked questions at the end: Have I been to fairy land? Of course, I went when I was eleven – it was magical. Have I ever seen a dragon in real life? Not yet, but I’m always on the lookout. This girl really nailed the Isadora Moon look so I just had to share it from Michelle Weissenbruch’s instagram! Next stop: Hereford and Cheltenham! If you’re reading this on the day it goes up (Sunday 15th October) then I’ll already be at Cheltenham Children’s Literature Festival, and I will have visited Waterstones Hereford yesterday. That’s the magic of scheduled posts! If you haven’t managed to make it to Bath, Hereford or Cheltenham, there are still plenty of opportunities to come to one of my events. Check them out on my events page. You can also follow my page on Facebook. I run giveaways every so often, including a costume competition coming up later this month!